Vauxhall Beach, London, originally uploaded by Craig Grobler. Yesterday, we popped into central London. It was packed not only with all the early international tourists but the locals seem to be streaming in as well. There is a stark contrast between the bustle of the city centre and the calm of river. I promised some people that I would post a pic of my local beach. 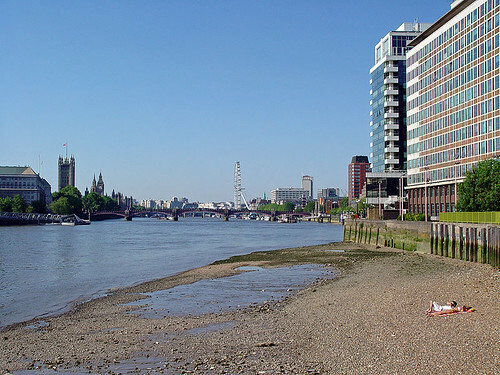 Here it is Vauxhall beach as frequented by (I'm guessing) German or Scandinavian tourist.